After upgrading to IE 8 FCKEditor does not startup anymore. Anybody seen similar problem(s)? Release(s) I tried up to 2.6.4 - all the same. Downgrading to IE 7 shows the same problem. The strange thing is that it seems to be dependend on the type of internet connection. I used a dial-up for testing - no problem. Using a wireless UMTS connection has the problem. Using the sample application has the same problem as well - so I would eliminate any integration problem from my side. I am having object expected errors on pages that use FCKeditor also. The pages work fine in Firefox on Win and Mac, and they work fine on Safari. Internet Explorer gives these vague error messages. Have you had any luck with a solution? Clear your cache and reload the page again. If you have modified any file, verify that your code is correct and it doesn't include any bug. *edit - fixed it! was an issue with relative pathing on the RSO. Editor was trying to load from a higher directory. Changed mwScriptPath to an absolute address as a temporary fix until I can figure out how to path it correctly. 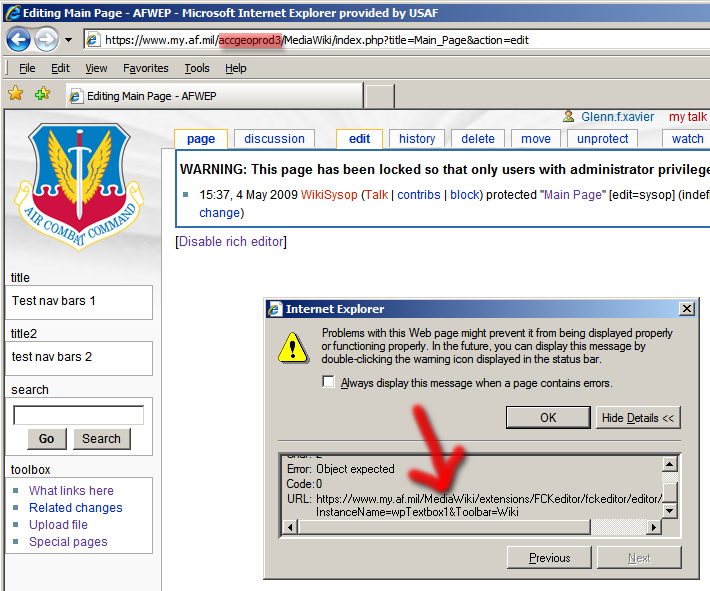 I'm getting a similar error in IE 7, but only when accessing my wiki from our public RSO junction. When I hit my wiki from the local server address, the editor has no problem loading. In the first image (fig.A) you'll see its loading fine, from our internal server address. In the second image (fig.B) you'll see the editor trys to load, but then fails after a few seconds, throwing a JS error. I've spent about 5 hours on this now, reloading all code from scratch, various builds, and clearing all the caches. I can't get it to work no matter what I try. Latest FCKeditor extension and editor nightly build. The reason the editor won't load, is because it's missing the accgeoprod3 directory in the path. What variable, and where, do I need to change to make sure that accgeoprod3 directory is thrown in there? I've tried changing just about everything to absolute pathing and it still won't work...nothing seems to change what is shown there. I must be missing something blatant and retardedly stupid...but I don't see it. It works GREAT on the local server address, but this is only failing on our reduced sign-on page... for some reason it going up a directory and missing the target.